ABBOTSFORD, British Columbia, Canada (AP) -- A Romanian immigrant has given birth to her 18th child in British Columbia, making her the province's most prolific mother in 20 years. Proud dad Alexandru Ionce said Saturday that his 44-year-old wife, Livia, gave birth on Tuesday. Their daughter Abigail weighed in at seven pounds, 12 ounces. "We never planned how many children to have. We just let God guide our lives, you know, because we strongly believe life comes from God and that's the reason we did not stop the life," said Alexandru Ionce. The couple immigrated to Canada from Romania in 1990 and now live in Abbotsford, British Columbia. Their 17 other children range in age from 20 months to 23 years old. Ionce said he did not know if the couple would have more children. The family now has 10 girls and eight boys. "We would have liked a boy to be even," he said. "We thank God all of them are healthy and happy." Ionce said the family has received calls from Germany, Romania and England, as well as from media outlets across Canada. phi catherin, keep em comming, hope you are well, you have been quiet for a while, margy 52 and still living in hope. 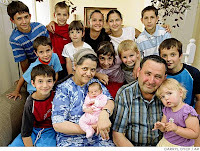 I wonder if this Romanian woman conceived at 44? Margy - thanks, I am well - broke my leg badly last year, so I was laid up for a while - but I am OK now. We are ready to move on and are looking into foster care of infants. Hopeful, sorry, I don't have any contact info for her - just read her story online. However, the story originated from Abbotsford, so she may live there.